Does your company struggle with stressed out employees? With teams that seem rooted in place, unable to proceed with projects? Do you find yourself managing low productivity and working tirelessly to correct confits? What if we told you there was a better way? Improve your workplace productivity and enhance your employee's social interaction while reducing stress levels. It may sound like a daunting task, but Altrex Performance Solutions is here to help you achieve these goals. We assist businesses of all sizes, working with individuals and teams to better understand how to function together more effectively. Focusing on interpersonal skills and the use of assessment tools, our team is ready to make a noticeable change in your organization. Contact us today to learn more. Create a more productive organization. Get started with a free 30-minute needs assessment. Altrex Performance Solutions (AltrexPS) uses a three-step approach to help you increase productivity and improve employee cohesiveness: Assess Needs, Design Solutions, and Deliver Results. We'll assess your needs during a complimentary 30-minute assessment, implement strategies to achieve specific goals, and evaluate success before recommending future steps. AltrexPS uses the Everything DiSC assessment tool to note behavioral profiles and help people understand their personalities and traits while learning to recognize the personality styles of others. With us on your side, your company will reduce unneeded friction and evolve into a more productive environment. 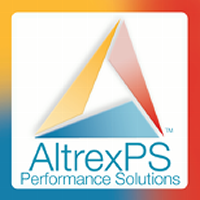 Altrex Performance Solutions is a full-service training, coaching, and performance development organization. We provide consulting, training, and performance tools to help companies reach their business objectives through and with their people. We accomplish this through an integrated approach using assessments and learning tools, training processes, coaching, and performance consulting. Everything DiSC® and Five Behaviors of a Cohesive Team™ are registered trademarks of John Wiley & Sons, INC. all rights reserved.